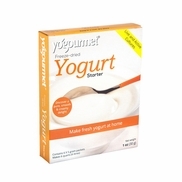 Yolife Yogurt Maker Machine is the fast and easy way to make fresh yogurt at home. In just 8-12 hours, the Yolife Yogurt Maker machine can make up to 42 oz of nutritious yogurt from milk or soymilk in the convenient glass containers that are included. Or, you can choose to use your own larger containers to make up to 80 oz of yogurt at a time. 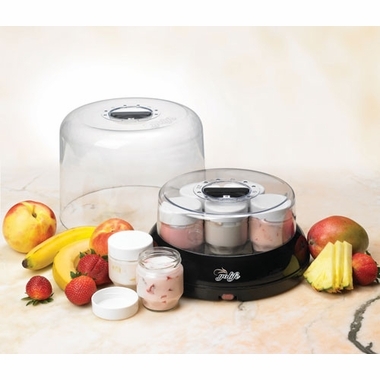 Simply add milk or soymilk, active cultures, and your favorite flavorings to make deliciouis and creamy yogurt at home.�Yolife Yogurt Maker machine maintains the optimal environment for the active cultures to quickly turn your milk or soymilk into nutritious yogurt filled with beneficial probiotics. Yolife Yogurt Maker machine comes with seven convenient 6 oz glass jars so you can have fresh yogurt every day of the week. 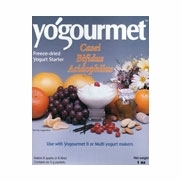 Unlike other yogurt makers, it also comes with a large lid so you can use your own larger containers for making up to 80 oz of fresh yogurt at a time. That means you can use your glass storage jars, food processing containers or other containers to make your fresh yogurt. Yolife can even make yogurt inside Tribest Personal Blender blending containers - so you can make your yogurt, add fresh or frozen fruit, and instantly whip up a delicious blended smoothie. 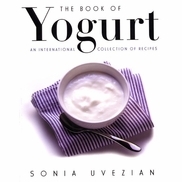 Yolife For Your Health: Yogurt is an important source of probiotics that are crucial for helping maintain proper digestive and overall health. Probiotics, like the active 'friendly' bacteria (also called 'flora') found in yogurt, may provide health benefits when consumed in significant enough quantities. Making fresh yogurt at home in the Yolife Yogurt Maker can provide you with higher amounts of active probiotics in each serving than you can find in store-bought yogurt.�That's because the active cultures in store-bought yogurt can decrease while sitting on store shelves for long periods of time.